Brazil-born, Barcelona-based DJ and producer ANNA has garnered international accolades from Mixmag, BBC Radio 1 and others with recent releases on the likes of Diynamic and Turbo Recordings. But her skill set reaches far beyond the studio realm as 2017 marked her busiest year to date. Beyond a whirlwind of festival appearances (including Movement and Awakenings), ANNA had the opportunity to perform at iconic clubs such as DC-10 and Fabric. 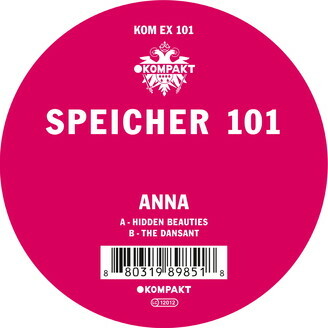 This passion for the dancefloor was fuelled by a youth spent in the DJ booth of her father’s night club – and it now leads to her first outing with Kompakt: SPEICHER 101 carries the DNA of both the studio head and the club dweller, crafting two propulsive, massive belters out of simple, but effective ingredients. HIDDEN BEAUTIES dominates the A-side with raw bass power and sizzling drops of acid, while the flipside brings you THE DANSANT, one of these spiralling minimalistic techno bangers that just seem to grow indefinitely. The release is also a personal milestone for ANNA, as Kompakt’s records have always been a staple in her sets: “I have so many records from Kompakt, I’ve had them since I started, and even though I played so many different styles through the years, I can safely say that Kompakt has always been in my crate.” Her very own release on the label, however, seemed “like a distant dream”, she says. Turns out it wasn’t that distant after all – thanks to her knack for seriously catchy techno with a punch, nurtured by hard work and persistent focus. A perfect fit for Speicher.